Coming from someone that absolutely loves Adobe Lightroom, I have to say, the Iridient Developer has a great many positive attributes to processing RAW (RAF) images from the Fuji X-Trans Sensors. 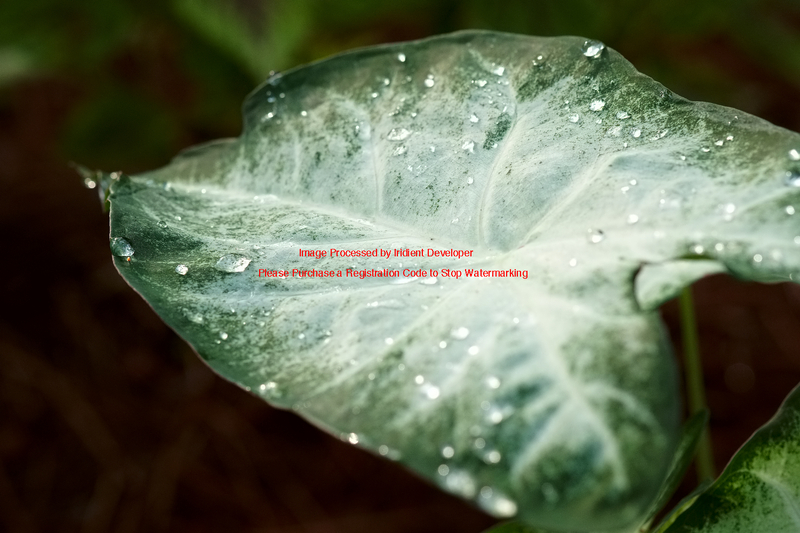 This was a simple macro shot of a Caladium leaf that had rain drops left. The color was true and very little contrast was added. Click to take a look at the full image which I scaled down to 1000 x 1500. Lightroom doesn’t yet have the processing to read these X-Trans files with such clarity. To be fair, Lightroom does a stellar job with my Leica raw files, but not the Fuji X files. I’m at the point where I will develop a workflow around Iridient and let you know how I decide to incorporate that into Lightroom. Oh, and by the way, this was shot with the XF 60mm macro lens. The image was taken using ISO 1600, 1/500 sec at f/5.0. So, with a high f/stop, look at the great round bokeh from the out of focus rain drops. It’s maintained with the f/stop leaves, which Fuji designed for this purpose. Also, look at the color and clarity at ISO 1600, once again, great job by Fuji.